Patient Zero: Fast-Paced Zombie Action! Look, I think that everybody loves zombies at this point, right? Well, at least it seems that way – I mean they are everywhere! They have even invaded the timeless classics, like Pride and Prejudice. 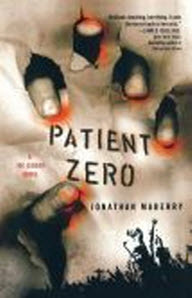 I’ve had Jonathan Maberry‘s Patient Zero for a while, and, due to some time off of work recently, finally had time to pick it up and enjoy it. This book was made for me. I not only love the horror genre, but also really enjoy reading espionage thrillers. Maberry has done a great job of combining both genres. Joe Ledger is an above-average cop, excited about going to Quantico to begin his FBI training, when he is “solicited” by a deep black group for a special project. Zombies are being weaponized for world destruction, and after proving his skills against “patient zero” Joe is brought in to help fight the plague. 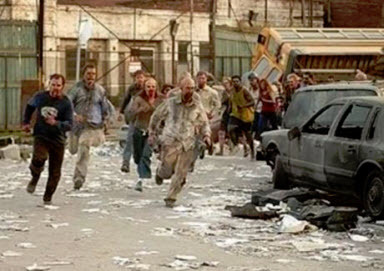 I think that the bar on zombie movies was really raised by 28 Days Later, where we were introduced to the fast zombie. The slow-witted shuffling ones were bad enough, but to have the threat suddenly move, and swarm, faster almost than a human was a recipe for panic. Maberry takes the bar up another notch because these zombies are being experimented on and the infection refined for increased rapidity of change time. Time from being bitten to becoming a zombie is decreased to a rate that promises worldwide infection within days. The possibility of an antidote is dangled tantalizingly, but the fast-change time complicates the potential for administering something like this. Joe and his team are under incredible stress to solve the problem, and the complexity of the situations that move the plot forward were well-planned and definitely made me keep turning the pages. This is the first work by Maberry that I have read since the trilogy that began with Ghost Road Blues. I was pleasantly surprised by this trilogy, which has many of the common horror tropes, but manages to put some different and interesting twists into the mix. I think that if you are someone who enjoys Stephen King, then you would like these books. They center on a comic book owner in the town of Pine Deep who gets mixed up in a seriously scary situation. The town is best known for its Halloween celebrations each year, but soon becomes the center of a battle between good and evil. There is an otherworldly blues player (complete with a busted up guitar on his back) who must face up against an ancient evil that has been buried deep in a dark part of the forest for years and years. This isn’t their first battle, of course, and many others are pulled into the fray as they fight it out. I think my favorite part is the re-creation of the ancient evil. There are both vampiric and werewolf tendencies, along with some paranormal aspects. It’s a true monster built from various nightmares. The character development in these books is well done and the situations, while familiar, are still made fresh and interesting. There is good reason why Maberry won the Bram Stoker Award for Best First Novel with this story. The remaining two books in the trilogy, Dead Man’s Song and Bad Moon Rising, don’t slack off. I have the feeling (and it may be because I read it somewhere) that Maberry actually wrote all of them at once, as if they were one really long work, and then broke them up into three books for publication. This would also seem likely due to the promptness with which they were published, each of them coming out very close to a year after the last. I remember devouring these as they came out and then having to wait until summer for the next one. Fortunately, if you haven’t read Maberry yet, you can grab all three in the trilogy (and maybe even Patient Zero) and devour them at once!